In the mid-90s, the annual volume of plant emissions into the atmosphere was more than 118 thousand tons of sulfur dioxide; per person in the city - about 7 tons. Photo: Ivan Chesnokov. All rights reserved.Karabash, a small town in Russia’s Urals, is known all over the world for its shocking environmental pollution. 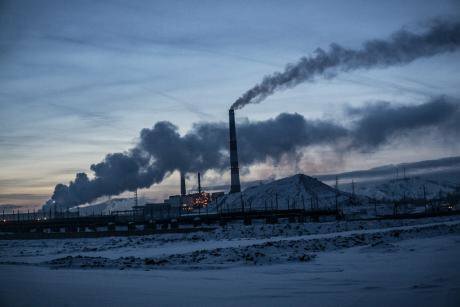 The copper-smelting plant has been polluting the ground and air of this company town since the beginning of the last century, and in the mid 1990s Russia’s Environment Ministry declared the town an environmental disaster zone. Both residents and experts put Karabash’s high mortality rate from cancer and respiratory diseases down to the town’s copper plant. In the town’s early years, its population reached 50,000, but this number has gradually decreased to its current 11,000. Local authorities and plant management claim that the environmental situation is getting better, but residents don’t believe them. While 2017 may have been Russia’s Year of the Environment, there’s been no noticeable improvement in Karabash. “I’ve long since given up drinking the tap water,” says Vladimir Kartashov, who has lived here all his life. “I go to a spring and fill up large bottles.” I’m sitting drinking tea with Vladimir and his friend Vyacheslav Serov in a well-worn kitchen in a typical five-storey block of flats. This neighbourhood is regarded as the newest in town: it has food shops, several cafes where you can have a meal for 200 roubles (£2.20) and a library. The flats are as far away from the smelting plant as possible — until a few years ago they were safe from toxic emissions, but this is no longer the case. Karabash, which in Turkic languages means “black peak”, was founded at the end of the 19th century, near the Sak-Elga River. At first gold was mined here, but soon they also found copper ore, and in 1910 they closed down two of the early copper works and built a new smelting plant that is in operation to this day. Only a few years after its opening, the company was already providing a third of all Russia’s copper. Over the decades a proper town grew around the plant — a town with schools, a nursery school and a population of 50,000. But the longer the plant operated, the worse the environmental situation became. Production continued at the same level, but no one thought about building waste treatment facilities. Karabash city arose from the copper and copper smelting. 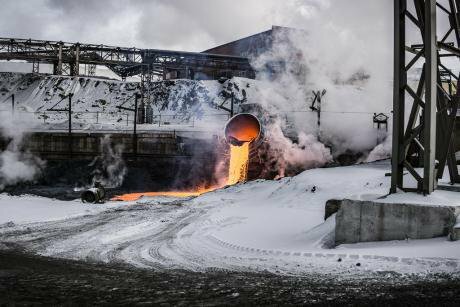 Photo: Ivan Chesnokov ©The process for producing copper from its ore creates a lot of toxic gases containing heavy metals (lead, arsenic, sulphur, mercury). Emissions of these harmful substances into the local environment were not monitored, and for many years effluent was simply dumped in the Sak-Elga. According to Russia’s Presidential Council on Civil Society and Human Rights, 100 hectares of land have been contaminated and deposits of iron, zinc and sulphuric acid have been leaching into the river from the slag heaps on the edge of the town. By the 1990s, 14m tonnes of waste had been dumped there. Trees stopped growing on the mountain around the plant and the earth turned black. People began to call this place the “bare mountain”. The area around the copper works looks like a post-apocalyptic landscape, with its dead foliage, orange river (thanks to the copper and other substances in its water) and polluted lake. All the fish died, and the locals stopped hearing birdsong around the plant. A cross was erected on the “bare” mountain, inscribed with the words “save and protect” in large white letters. In 1989, the authorities finally closed the copper works, leaving a considerable part of the population unemployed. The socio-economic situation in Karabash, already bad, got even worse. After a few years, the plant re-opened under a new owner, as Karabashmed Ltd., but in 1996 the Russian environment ministry declared it an environmental disaster zone: the plant’s annual atmospheric emissions contained over 118,000 tonnes of sulphur dioxide — about seven tonnes for every local resident. (Sulphur dioxide irritates the mucus lining of the nose and throat and has a harmful effect on teeth. Excessive exposure can lead to weakness, dizziness and a hacking cough, and in worst cases to bloody mucus, shortage of breath and loss of consciousness). 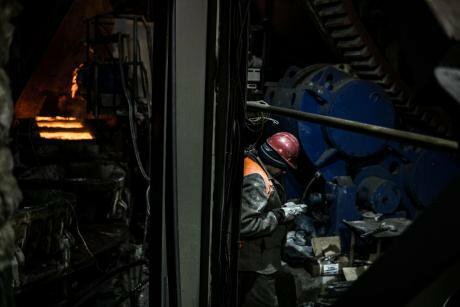 According to the city authorities, one workplace at the smelting plant gives from 3 to 5 new jobs in related industries and services in Karabash. Photo: Ivan Chesnokov ©In the first half of the 2000s the plant acquired a new owner — the Russian Copper Company (RMK), which is co-owned by two Cypriot offshore companies, Pyracanta Holdings Limited and Tilia Holdings Limited, and produces 30,000 tonnes of crude copper a year. 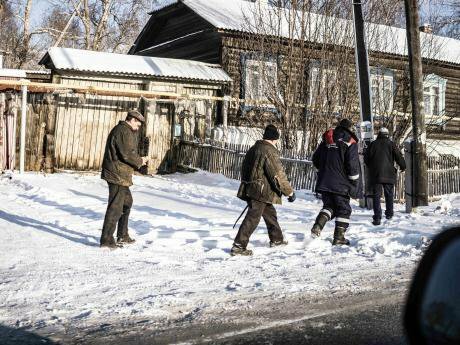 In 2015 the town had one of the highest death rates from all causes in the country, and in 2014 the highest death rate in the Chelyabinsk region was recorded there. In 2014 Karabash also had the highest death rate for young people in the region. Investigations revealed, among other things, that a considerable number of children had a raised metal content (lead, arsenic, cadmium) in their hair, and a higher than average amount of cadmium in their blood. Karabash’s “private sector” consists of some small wooden houses, and Karabashmed’s main chimney towers above their roofs. Vyacheslav Serov, who moved here ten years ago when he married a local woman, knocks on the gates and doors of the houses, introducing me to residents who can talk about their problems. Everybody we talk to says the same thing: the locals don’t have to pay ground rent, since the soil is so polluted, and after complaints about air quality the plant is paying compensation — an average of 3,000-5,000 roubles [£39-64] per person. But neither the money nor the numerous research projects by independent organisations and experts can help people leave the poisoned town. 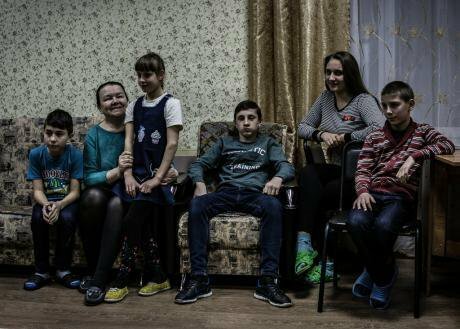 “How can people move elsewhere for work if the average monthly wage here for people who don’t work for the company is only 10,000 roubles [£127] and no one wants to buy flats?” asks Irina Shabalina, the former editor-in-chief of the Karabash Worker newspaper. Not, she says, that company workers earn a lot more: the average is 15,000-20,000 roubles a month. Shabalina has chronic pharyngitis and her child has bronchial asthma, and she blames it on Karabashmed. She has a constant burning sensation in the back of her throat and says she often covers her face with a scarf on the street — the gas makes breathing impossible. She periodically brushes white flecks of chemical compounds from her clothing. In 2015, discontent with the smelting plant led to a rally attended by 500 people. On one side, Shabalina tells me, were the irate residents; on the other, plant employees. One lot were yelling, “Shut the plant down, you bastards!” while the others responded with, “Who’s going to feed you then?” Plant employees, however, told her anonymously that the gases produced by the smelting machinery caused respiratory tract problems. Ten percent of Karabash residents work at the smelting plant. If you take family members into consideration, it works out that one person in three has connections with the company. Over the years whole dynasties have arisen: someone’s grandfather worked there; someone else’s mother; a third person’s entire family. The company consists of a plant producing crude copper — up to 130,000 tonnes of it a year — and an enrichment plant for slag processing. RMK, Karabashmed’s owner since 2004, has over the years invested 18 billion roubles (£231 million) in new technology and waste treatment facilities. Aleksandr Alferov, Karabashmed’s deputy social director, backs up Migal’s words, saying that the company now pays a lot of attention to environmental issues, and that thanks to all the new treatment technology, “trees have started to grow again on the bare mountain”. Thanks to RMK, the town now sports a health and fitness centre and a church, with a shopping and leisure centre under construction. So what can Karabash’s residents and main employer do to improve the town’s ecological situation? There’s different points of view on this question. The town’s mayor Oleg Budanov thinks that the land in Karabash is undergoing a natural process of purification. RMK, he tells me, is also proposing to recultivate a derelict disposal area of its Soviet-era enriching plant. Work on this plant, also in the Chelyabinsk Region, began in 2017, but local residents protested against it from the start, setting up a group with the snappy name of “Stop GOK” (GOK is the acronym for a mineral enrichment plant). But neither their warnings about serious environmental consequences, nor the daily picketing of the gubernatorial offices, nor 160,000 signatures on a petition stopped RMK. And regional governor Boris Dubrovsky supported the company. RMK’s founder Igor Altushkin has sufficient influence on the regional government to push his controversial projects through. In order to comply with all the environmental regulations connected with the GOK’s construction, the regional authorities (on Dubrovsky’s own initiative) decided to carry out an environmental audit. The competition for the job was won by Yekaterinburg’s Ural State Mining University, one of whose sponsors is RMK. And the auditors approved the project. Even if the plant were to stop dumping in the river today, it would still be polluted. 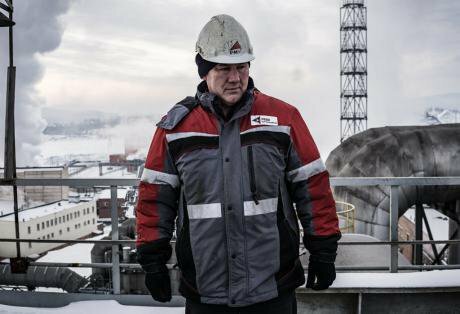 Photo: Ivan Chesnokov ©Blokov doesn’t know what to offer his local community, to keep them in Karabash: “Perhaps work under a rotational system at the smelting plant? But it would still need to reduce its waste to permitted levels. And we would still have to isolate the slag-heaps, to avoid polluting the water and soil.” Blokov doesn’t have a clear solution to the problem. The local residents are, it seems, reconciled to their fate. A few of the people I spoke to are intending to move elsewhere, but the rest don’t know where they would find the money to relocate.